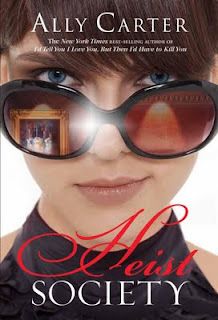 Heist Society by Ally Carter. Disney Hyperion Books. Publication date February 2010. Young Adult. Reviewed from Uncorrected Advance Proof from publisher. The Plot: Katarina Bishop, 15, ran away to boarding school with the hopes of leaving her family and her past life behind her. Alas, just when she thinks she is out, they pull her back in. The family business? Stealing. Long and short cons, pick a pocket or two. A powerful criminal believes that Kat's father, Bobby Bishop, stole his art collection. The only way to save her father? Find the real thief and steal back the collection. Kat is rusty from being out of the game; and it's more than a one person job. She's going to need all the help she can get to pull off this heist. The Good: What is good? Every. single. page. Likable characters that you want to spend time with, plenty of humor, great action, a wee bit of art history, a variety of exciting locations, strong female characters, and cute guys. What more does a reader want? You know the crew from Ocean's Eleven ? Now imagine that they had kids who are now teenagers; teens raised in the world of cons and stealing. That is Kat's world; the one she tried to leave, because, you know -- stealing. Kat gets dragged back to save her father (when this movie is made, and I cannot believe it's not optioned yet, George Clooney has got to play Bobby Bishop). Kat's resurfacing in this strange world is a brilliant literary choice of the author; because as Kat is reintroduced to her old world, so is the reader introduced. This avoids the sometimes necessary but always awkward infodumps of background information; instead, it's information woven into the story and Kat's story and Kat's return. Just as you cannot watch the crime capers such as Ocean's Eleven and The Sting and think "but that's ILLEGAL" (cause that type of thinking, friend, ruins the fun) so too can you not think that way about Heist Society. Even if you were going to get all moralistic, Carter gives a story line where the so-called owners of the art are as far from sympathetic and morally correct as you can get. Kat is smart and knows her stuff, as befits someone raised in a world of thieves. At the same time, she is only fifteen (and she did take some time off). in other words, Kat is hardly perfect or without error. She is no Mary Sue, despite speaking four languages and being able to put together and lead her own crew of teenage thieves, pickpockets, and scammers. She is fun, funny, sometimes wrong, sometimes right. Heist Society takes place over fourteen days, the amount of time Kat has been given to save her father from the mobster. Each section heading counts down the time remaining (6 Days Until Deadline) and gives the current location (London, England) because of course, there is jumping from country to country as Kat assembles a crew and tracks the art thief who framed her father. Carter has done such a stellar job at plotting out the various criminal schemes that I wonder if she is secretly in the witness protection program because of her past life as an art thief. Only, I guess, not so secret anymore. Honestly, I want to know what research she did because Heist Society feels very real and accurate; I was guessing the whole way about what would happen next, with just the right mix of wrong and right guesses; I was surprised at times; and I loved the ending. While this book strongly stands alone, I was very happy to read at Carter's blog that there is a sequel in the works. Fans of Carter's Gallagher Girls book will be thrilled by this new series; and those who aren't fans are only not fans because they have not yet read an Ally Carter book. This is a good place to start. I did not get the "cat burglar" play on Kat's name until I read the author's blog. Sigh. When I saw there is a new book by Ally Carter, I didn't even read the review, I clicked over to my library to reserve a copy. Then I read the review, and I'm even more excited. Can't wait for this one! This sounds like one of the best ideas ever, and Ally is just the person to write it. Cool! Liz, you made me want to read this IMMEDIATELY! I read and ARC of this book as well and I loved it. Ally Carter is one of my favorite authors and she her lasted book doesn't disappoint. Sorry for all the typos in my last comment. I just woke up and I'm still really tired. I meant to say: I read an ARC of this book as well and I loved it. Ally Carter is one of my favorite authors and her latest book doesn't disappoint. Great review. I have to read this book now! I've been dying to read this one, it sounds amazing. Plus I adore the GG novels! I cannot wait for this to come out. They are such fun books! Great review too. Your review convinced me: Must. Read. ASAP. Plus, the cover's adorable. TOTALLY want to read this now. Thankfully, the library's obliging and has it, too. YAY! I want to read this book so bad it hurts! I seriously cannot wait until the release date. Great review! I love Ally Carter books and I absolutely can't wait to get my hands on this one. Isn't Ally Carter awesome? I love how she makes it look so effortless. And I want everyone to agree with me that she and her books are awesome, so I adore all your comments that share the Ally Carter/ Gossip Girl/ Heist love! LEVERAGE!!!! Thanks for the reminder to make sure my DVR will start recording when it starts up on January 13. How pathetic is it that I have never seen Ocean's Eleven? Still, you're absolutely right about casting George Clooney (who, I believe, is Ally Carter's secret boyfriend). And let me just say this: Ally Carter will be at Winter Institute next month. So will I. You know, I still haven't read the Gallagher Girls series even though I keep meaning to. But this post is is really making me want to read Heist Society, as well as move her previous books waaaay up on my To Read list. Huzzah! I love the Gallagher Girls and I was really excited for this book, but at the same time a little anxious. You know how an author hits the right mix once but not the next time? Glad to hear that's not that case. I agree, the entire time I was reading the book, I was picturing George Clooney as Bobby!